Using data to drive business decisions is crucial for growth. But, data can be hard to make sense of. Especially when there's so much of it. As humans we're hard wired to share stories, and find it easier to learn when information is shared through a compelling narrative. So, if you want your data to make sense and add value to your organisation you're going to need it to tell a good story. First: What is data storytelling? Data storytelling is the art of creating a narrative with data to translate it into actionable business insights that anyone can understand. Using traditional storytelling techniques it turns data and analytics into an engaging story that answers key questions to influence business decisions. While many organisations already use data analytics and visualisation to try and make sense of their data, these don’t always drive actionable insights and often lack connection to business outcomes. Data storytelling fills this gap providing answers to the “so what?” behind the data and the visuals and giving context for why they’re important for the business. So, what makes a good data story? 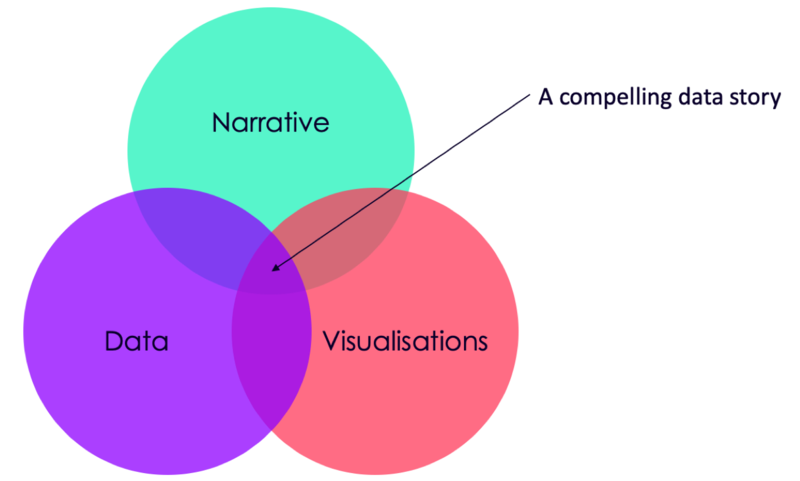 Good data storytelling combines three key elements, data, visualisations and narrative, to explain what’s happening and why it’s important for the business. It highlights key insights that may have been missed in the raw data and engages the audience to incite change. Data forms the foundation, providing the raw material that will help us find the right insight. Visualisations help us see the trends or patters in the data. The narrative then describes what the data is showing and provides the context for why it’s important. Good data storytelling takes all that information uncovered throughout an analytics project, and condenses it down into the key findings that will have the most impact or benefit to the organisation. Rather than focusing on the amount of data or the techniques used, data storytelling uses an engaging narrative to convey why these insights are important and the action the organisation should take. For example: Auckland event organiser ATEED was considering a new location for the annual Auckland Lantern Festival. The available data included how many people attended the event each year, where they originated from, and general demographic data. The question they needed answered though was whether the proposed new location could impact event attendance, and was therefore suitable as an alternative. The story all this data told was that due to continued growth in attendance the current location was becoming too crowded. As many of the attendees originated from the inner Auckland suburbs the proposed venue outside of the city would negatively affect attendance. Another, larger, central Auckland venue would allow for continued growth in attendance, and ensure the event would still be accessible to its core audience. Why is good data storytelling important? The data organisations collect provides a rich foundation of information about how the business is operating, or about how their customers engage with them. But data by itself is just a collection of facts. Data storytelling allows organisation to not only uncover critical insights but communicate these with key stakeholders in an easy to understand format, and enable them to make faster and smarter decisions. It also allows more business units to make sense of and use the data that is being collected. Rather than just receiving a report or having access to a dashboard, data stories share useful information that can be acted upon. As organisations invest more time and money into data analytics it’s important that the results of the analysis isn’t going to waste. Rather than just focusing on uncovering key insights, effort should also be given to how these insights can be communicated effectively throughout the organisation. Data storytelling provides important context for data, increases understanding of it, and helps delivers invaluable insights to the organisation that support business growth. Want to turn your data into engaging stories? Get in touch.